San Francisco has to be one of the easiest cities to get around on foot, since when you’re tired of the hills in the bay area you can hop on a cable car (or tram as we Brits might say) and carry on your intended journey at twice the pace but with reasonably similar views. Anywhere you see the brown and white cable car sign or turnaround junctions, is where it stops, so you can usually hop on and off. Don’t get put off by the queues which form, the cable cars accommodate around sixty people and come along pretty regularly. Given that the San Francisco cable car is a destination in itself it’s cheaply priced and it means you can get up Nob Hill without feeling wretched by the time you reach the top (it’s steep!). When I was younger, my family and I were doing a road trip on the USA west coast and San Francisco was finding its identity post-hippy – Height and Ashbury time. I remember the main tourist destinations; Golden Gate Bridge, the Golden Gate Park – even Lombard Street with all its wiggles and turns. At that point in time tourists would queue up in their hired vehicles to see if they could make it down the street without crashing…What fun we had watching car after car slamming and screeching and bumping its way to the bottom. On Pier 39 we were fascinated by the Christmas shop which was open all year. I bought a red, white and green cable car from there (which amazingly I still have today) and that was because I completely fell in love with riding the cable cars around the city. Given my age at the time, I must be remembering incorrectly, because I think my parents got so fed up with me wanting to spend all day on the cable car that they let me sit on one for ages going backwards and forwards, practising jumping on and off (no brown signs as I recall) – alone. They went off sightseeing whilst I perfected Evel Knievel style stunts off the side of the cable car which was to stand me in good stead when I later lived in London jumping on and off the old Route Master buses. It wasn’t just that the cable cars presented so much daredevil fun, it was the fact that you met lots of people on them, not just tourists, but genuine San Franciscans who used the cable car to get across town to work. The seats were highly glossy dark wood, worn smooth by so many moving bottoms over the years and you held on with the bar which ran parallel to the seat. Often if it got cramped, you could at the time, swing off the bar and just keep your feet on the platform, leaning out and pulling back in when cars went by. 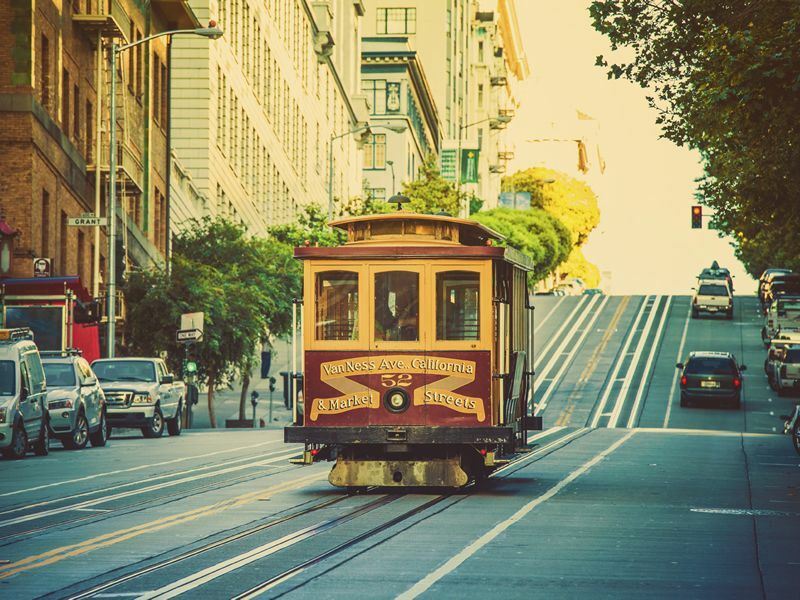 The topography of San Francisco mean that there are times when the cable car seems to be plummeting towards the Bay and you just hope that the brakes have been checked – high brake squealing is not the most confidence boosting sound. A great place to board the cable car is down at Fisherman’s Wharf - the queues go quite fast and you can just get on the first one which turns up, ride the line and then come back again. Ride the California Street line if you are riding just for fun because it is less busy than the others. Unlike a British bus, you don’t pull the rope when you see your stop ahead – you shout “next stop please”, and the “grip” guy pulls it. The cable cars are so much more than transportation in San Francisco – they are an experience in themselves and definitely not to be missed. The fact that they are still around since their introduction in 1873 testifies to their usefulness in a city which could be defined by the gradient of its hills. My abiding memory of the city which I’ve since visited half a dozen times is still the cable cars; which I think gives you some idea of how first impressions of experiences whilst travelling can be lasting ones. I don’t advise anyone to copy my daredevil antics, indeed I’m pretty certain in such a litigious country as USA you would be unable to recreate my stunts, but I can recommend the cable cars for fun, for tired feet and great views. Further reading: If you’re considering a trip to this iconic Californian coastal city, then check out our top 10 things to do in San Francisco. Article written by Sam Hohol.